A melancholy food vendor's life and business are revitalised by a mysterious elderly woman and her culinary skills. 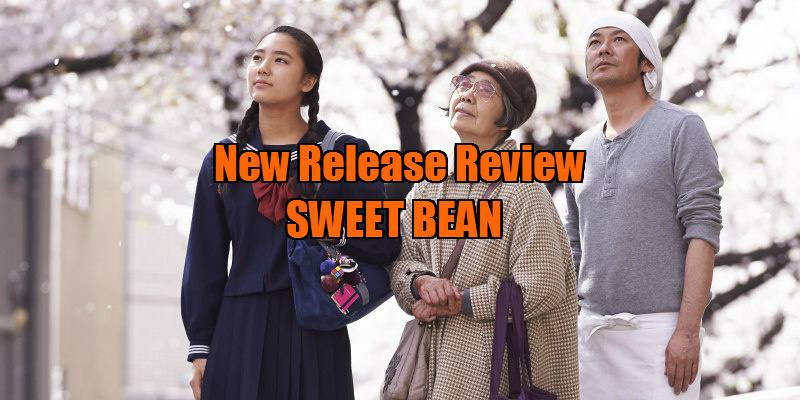 Sweet Bean isn't quite up there with the best of recent Asian drama, but it's not far off, and like all good drama, it leaves us longing to spend more time in the company of its characters. It's a confection as sweet as its titular treat. When it comes to simple yet stirring human drama, Asian cinema has been schooling the West in recent years. Leading the field of course is Japan's Hirokazu Koreeda, whose recent hat trick of I Wish, Like Father, Like Son and Our Little Sister make him arguably the most interesting filmmaker working today. Now a female compatriot of Koreeda's, Naomi Kawase, is throwing her hat into the ring for the title of contemporary Japanese cinema's answer to Yasujiro Ozu. I was far from convinced by Kawase's previous effort, last year's self-indulgent Still the Water, but Sweet Bean is an enormous leap, a remarkable growth in maturity in such a short space of time. It's the story of three everyday people, and like the protagonists of so many recent Asian dramas, they're people we'd happily hang out with every day. The permanently hungover and bedraggled Sentaro (Masatoshi Nagase) runs a failing street food kiosk, serving 'dorayaki' (pancakes filled with red bean paste known as 'An') to a dwindling number of customers. One of his regulars is a teenage girl, Wakana (Kyara Uchida), who seems equally put upon despite her youth. Presumably out of sympathy for a fellow broken soul, Sentaro gives Wakana free leftovers each day. Into Sentaro's life and business hobbles Tokue (Kirin Kiki), an elderly woman who asks if she can work at his kiosk preparing An. Sentaro politely refuses, but Tokue doesn't take no for an answer, returning with a sample of her sweet bean paste. Sentaro tries some and his face subtly betrays a joy we suspect he hasn't felt in quite a while. Ignoring her age and the curious condition of her deformed hands, Sentaro takes on Tokue, and his business begins to boom as word spreads of her culinary magic. All is going well for Sentaro until rumours of Tokue's leprosy begin to spread. Kawase doesn't quite have the storytelling skill of a Koreeda yet, and the final act of Sweet Bean meanders somewhat as a result, but she's delivered a movie that favours character over narrative, and when the characters are as likeable as the central trio here, it don't worry me. Old people tend to be more cinematic than young people, because every movement has meaning, and Japanese characters are often more interesting to observe on screen than their Western counterparts thanks to the curious dichotomy of repressed feelings and physical gestures. As an elderly Japanese woman, Tokue is a pleasure to watch, and her relationship with Sentaro is genuinely heartwarming, the elderly lady bossing her young employer around like Yoda schooling Luke. Seeing the latter slowly open up to the simple pleasures of life by following Tokue's lead is inspiring, and his late emotional breakdown, brought on by his enjoyment of an incredible meal, makes for one of the year's best "there's something in my eye" moment. Wakana is less well served, drifting in and out of the narrative without receiving the same attention as Sentaro and Tokue. There are hints at a tough home life with a mother who may be an alcoholic, and it almost feels somewhat cruel not to delve into her character a little deeper. 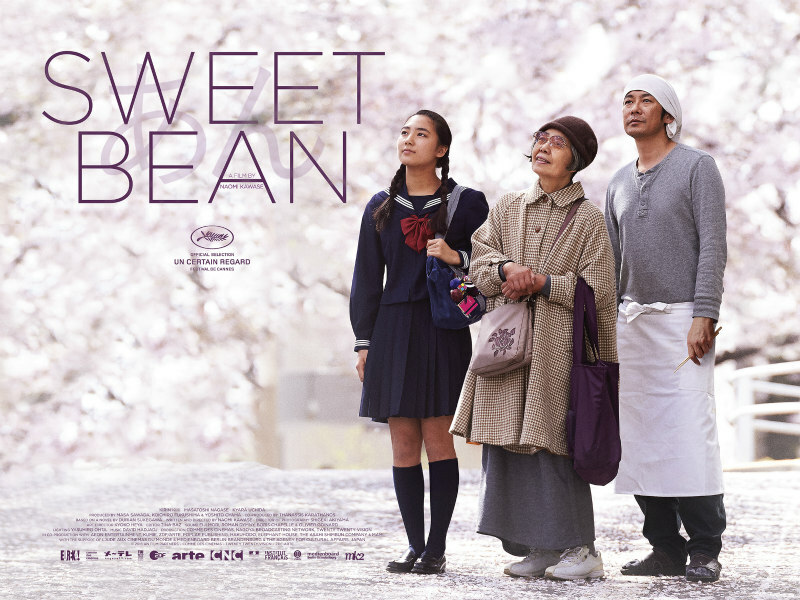 Sweet Bean is in cinemas August 5th.